Brig. Gen. James J. 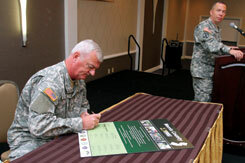 Grant, left, Chief of the Joint Staff, signs the Army Community Covenant while Picatinny Arsenal Garrison Commander Lt. Col. Herb Koehler, right, watches during the Morris County Chamber of Commerce meeting on Sept, 13, 2010. 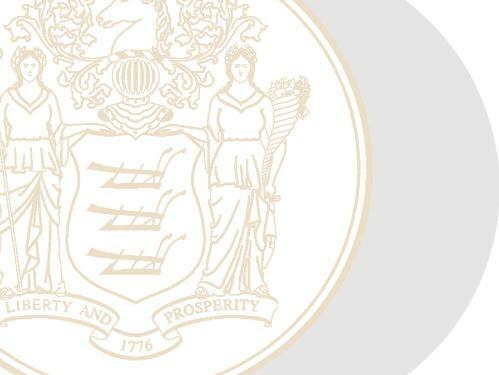 Morris County community leaders joined military representatives from the New Jersey National Guard and Picatinny Arsenal to pledge their support to uniformed personnel and their families by signing the Covenant. The Covenant program is designed to foster and sustain state and community partnerships with the Army to improve the quality of life to Soldiers and Families of the Army - Active, Guard and Reserve. Photo by Mark Olsen, NJDMAVA/PAO. Spc. Christopher Maute, center, 21st Civil Support Team (Weapons of Mass Destruction), searches for simulated suspicious objects during a weapons of mass destruction exercise at New Meadowlands Stadium on Sept. 14, 2010. 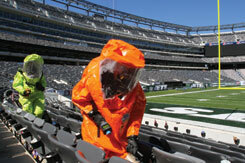 The 21st CST was joined by the Bergen County Office of Emergency Management, Joint Base McGuire-Dix-Lakehurst Office of Emergency Management, the United States Coast Guard Atlantic Strike Team, Meadowlands Fire Department, and the New Jersey State Police to train at the stadium located in East Rutherford. The units familiarized themselves with the stadium in the event they have to respond to a chemical/biological/radiological or nuclear event at the facility. Photo by Mark Olsen, NJDMAVA/PAO. Airman 1st Class Andrew Balint recites the Airman's Creed during the 108th Wing's Hometown Heroes Salute at the Timmerman Conference Center, Joint Base McGuire-Dix-Lakehurst, which honored more than 500 of New Jersey's Citizen-Airmen on August 15, 2010. The Airmen recognized included those who have deployed for more than 30 consecutive days in support of global operations since Sept. 11, 2001. The program's purpose is to celebrate and honor the signifificant contributions of National Guard Airmen, their families and communities. U.S. Air Force Photo by Tech. Sgt. Mark Olsen, 177FW/PA.